Born from a hot dog cart in Madison Square Park, the food cart was a success and snake-like queues started to form. 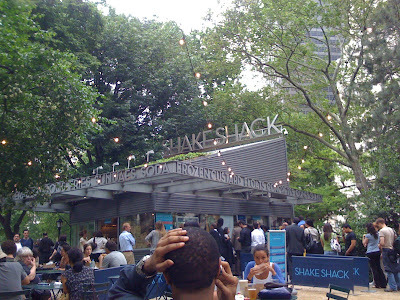 In 2004, Shake Shack was formed after being awarded the contract from New York City’s Department of Parks & Recreation and the Madison Square Park Conservancy to set up a permanent food kiosk in the park. Now, it had both US and international locations - United Kingdom, Turkey and Middle East. Shake Shack was highly recommended by a friend of mine. He always asked me to go to Madison Square Park to try the great burgers. However, the lines were exceptionally long during Summers. I came with my girlfriends and it took us about half hour before we made our orders. I loved the fact that we were eating burgers in the park. It was a very refreshing feeling. 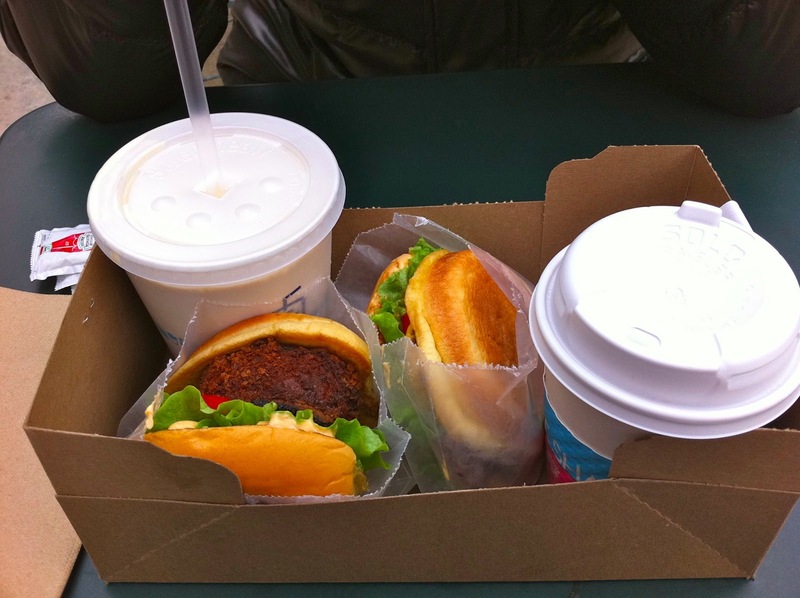 I ordered two burger meals - Shack Burger and 'Shroom Burger. The Shack Burger is cheeseburger topped with lettuce, tomato and Shake Shack's special sauce. The 'Shroom Burger was a vegetarian burger. The portobello mushroom filled with melted muenster and cheddar cheeses and deep fried to crisp. 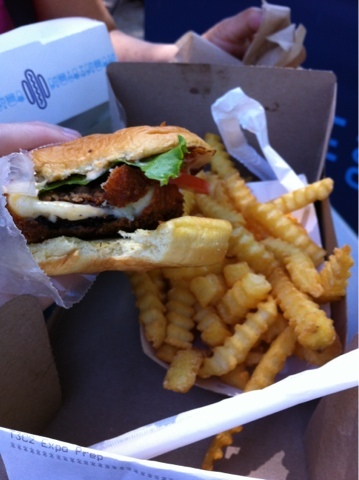 The mushroom was then topped with lettuce, tomatoes and drizzled with Shake Shack's special sauce. The 'Shroom Burger was the best amongst the two I ordered. The melted cheese oozed out after I made the first bite. It had a nice taste. I did not even think that I was eating a vegetarian meal. After the first time, I ordered the burger without fail whenever I was in the vicinity. The Shack Burger tasted and looked like any other cheese burger. However, the salient difference was the beef patty. It was not only thick but also tender and juicy. It was not easy to grill a thick patty and still keep the tenderness and juice intact. I must applaud to Shake Shack for doing it great. What lacked at Shake Shack was chilli sauce. So, you may want to bring your own chilli sauce to dip your fries.